I've been searching for a wireless camera solution to second my troublesome and unreliable X10-based alarm system. This dial-up central is very sensible to interferences and so always called me following a false alarm. Having a way to confirm visually an intrusion would be a good thing for the day this alarm would really go off for a good reason. I already tried a solution made of a RF-based DVR (the kind using an SD card to store the pictures taken) and some cheap cameras, but the picture quality was far too bad, partly due to the poor signal range. And if was ever to take evidences of an intrusion, I would have seen it days later, when back from holidays... what's the point then ? In comparison, the IP camera should be able to alert me by email when the intrusion occurs, and give me the option to access it remotely to get further evidences, and call the police the same day. I found what seems to be the cheapest Pan & Tilt IP camera with Wi-Fi capability on eBay (around 85€). 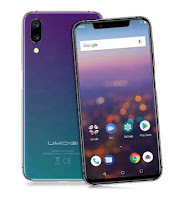 The device comes unbranded and contains no model reference, however, after some googling, it seems to match with the IP camera model FI8908W from Foscam. Led blinking Slowly: the camera is searching for an access point. Led blinking Faster: the camera connected to a wireless access point. This is only possible when the Ethernet cable is unplugged. The blinking rate should change within the first minute after turning on the camera. If it keeps blinking slowly for longer, you know there is a problem. The setup is fairly easy once you authorize IE to download unsigned ActiveX controls for your security zone, and also make sure that your anti-virus does not silently block the traffic, which was the case for me with Avast Antivirus. I had to set the camera address in the exception field of its network shield. To my surprise, the technical support from Foscam replied quickly and was friendly and helpful. The current firmware version (11.14.1.34) does not seem to implement the UPnP properly. When activated, it consistently returns "UPnP Failed: Errors in Chat with UPnP Device". According to Foscam, it does not work well at the moment and would be looked after in a future firmware. Beside that minor detail, the camera is easy to use with a decent user interface. I would however regret that the camera control is using ActiveX . So this product is primarily for M$-Windows users (Apparently there is a working software alternative for Linux called ZoneMinder but I didn't test it yet.) . The motion detection can be programmed for different times during the week and pictures can be sent automatically to an FTP server and/or and email address at a predefined interval. 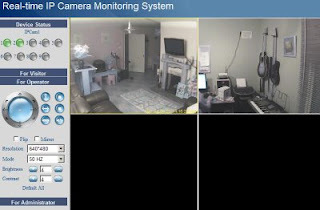 It is also possible to interface the camera with an external PIR sensor or alarm system through its RS485 connector. This green connector on the camera has 4 pins (shortly described in page 19 of the manual). - Pins 1 & 2 are for output: typically these would go to the wired inputs of an alarm central like the SC28 or SC9100. If the camera meets an alarm condition (movement) it would send the signal to the central like a DS10/18 (Door sensor) or MS10/18 (PIR) would. There's also a button on the Web UI that allows to activate pin1 manually. You would use these to link wires from a Sensor (DS10/18 have connectors available for that) or any PIR, so if they detect a movement, the camera would, I guess, upload pictures, send an email (as set in camera's Alarm Service Settings) and output +5V on pin 1. Dynamic DNS can be used for setting up a access from the Internet. It is then possible to log into the camera server and record a video if necessary. Thanks to the IR leds surrounding the camera lense, the image quality at night is simply as good if not better than during the day. There is a two-way audio monitoring support on this camera, which means that you can listen from it, and that part is okay, but you could also speak into your PC microphone and a speaker embedded in the camera will relay the sound. The very bad sound quality in this case will make that feature useless. 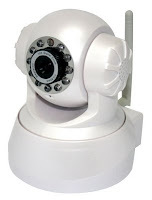 As a final word, this IP camera is a much better investment that the traditional RF-based cameras. The picture is of better quality despite the similar CMOS sensor and the added value to your home security system will quickly become obvious. Update #1: I recently purchased a second camera and picked a white version. The brackets enclosing the camera tend to be loose. As a result the motor doesn't always have enough grip to move the camera vertically. I think it comes from the thin plastic casing which seems to be of a lower quality than the black version. Update #2: After returning the defective white IP camera, I received another white one, obviously from a more recent batch, the plastic casing is less glossy and of comparable quality to the black model. There is also a small addition at the back of the camera: a mini jack connector for external audio. Since the embedded speaker is not great, you can now plug a better one in there. Thank you for your answer. The cam was Dealextreme and 100% foscam. my camera does this inital checkup then restarts and does it again in an endless loop. I think that the manufacture forgot to put any sw on it because this is the behaviour out of the back... i contacted foscam.. will wait for their answer. Just for the record, it's been established that icpams from DX are no Foscam products. The manufacturer posted a warning on his web site. unfortunately it seems these cameras are not secure! unless they have been fixed, you can find some in a google search and when it promts for password, clicking cancel will show the video. that's probably the case with some of the numerous clones out there. I don't have this issue with the Foscam fi8908w. But I'll really consider it secure when they'll implement encrypted login, which according to Foscam, is planned for around xmas. Hi Bubbah, thank you for this excellent blog! Very informative! I just purchased a Foscam IP PTZ camera and plan to use it (and add more later) as part of a security system for my home. What I was wondering is how weather resistant is this camera? If I mount it outside under our soffit where it won't get any direct rain, would this suffice? Is temperature a major issue with these cameras? I live in Canada and we've had winter lows of -20c, will this kill the camera? Do you have any suggestions for inexpensive enclosures? 3. The night vision would probably not work well: try the camera at a window looking outside and wait for the night. The IR leds will turn on and reflect on the window, blinding the camera. That's what I suspect would happen in an enclosure. No, instead, consider maybe a model like the fi8904w. I ordered one myself but it's still on its way from China. Ok, it's not pan & tilt, but it's more appropriate for outdoor use (still not sure for such low temps though). Regarding ordering from Dealextreme. Would it be safe to assume I'll get a Foscam? Or is it safer to go on Ebay and look for someone who can guarantee it is a Foscam? In their Contact Us page, Foscam warns about counterfeit cameras sold by DX, and also provides a list of trusted resellers. The one on DX that is clearly a copy is SKU 26358. The problem Foscam has with this one is that it uses their firmware. The problem you might have with it, is that some come with badly or damaged connection between the wifi antenna and the inside board, as well as same MAC address for all of them. I'll order from one of their approved ebay sellers. Feel free to come back anytime Carlos. I'll be diving into all your posts about it. 3rd part mobile phone software for foscam. www.totalcontrolapp.com. free demo on android, blackberry, and winmo. After receiving that list I bought Foscam hardware from surezan13. Prior to asking them for a list of trusted sellers, I bought from a "salejuly" user on ebay and it appears to be legitimate to me. Or, if you are suspicious of me (like you should be of anyone on the internet), just ask them directly: sales1@foscam.com - a nice lady named Terry should reply to you within 12 hours. 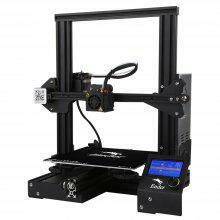 Our Ebay store (Ravat Trading Store) is not listed as an official U.S. distibutor on the manufacturer's website (foscam.com). We ship within 24hrs directly from Manhattan, NYC with USPS Priority Mail. Don't take a chance and get burned, buy only from authorized distributors. We have special going on right now where you get a good discount on each camera. The sale ends tonight but if you send me a message explaining that saw my comment on Gadgetvitims, then I will give you the discount even after today. Lol I meant to IS listed as an official US distributor, not "is not listed". Sorry for that. Hope someone can give help me abit on this please. I have the latest F/W from their site, it was shipped with it. 1. I noticed that indoor the quality is quite clear & sharp but when I direct it to outside the picture becomes overexposed (white pic)rendering the camera useless. Does it have exposure settings? if not could it be its Light sensitive resistor? However I can confirm that its working in dark & when enough light can see the red light of the LEDS go faint out. Is there something that I can do please? As for the WiFi I haven't had any issues, and I have my camera on 24/7. As mentioned by Carlos, you can adjust the brightness and contrast of the picture. If it's outdoor, select the outdoor setting and not 50Hz (or 60Hz), it will be too bright. At the beginning I also had the same disconnection problem than you. I just replace the antenna of my router by a bigger one with a bigger gain and moved it to a better place. I did the same with one camera which was too close from a metal ceiling. Since that my both cameras are working very well without disconnecting. Caros, será que alguem poderia me ajudar a configurar minha Foscam para que eu conciga conecta-la fora da minha rede, pois hoje eu só concigo conecta-la da minha rede local não concigo me conectar, de outro pc fora da minha rede. Estou a preparar um post sobre esse tipo de coisas no meu blog, mas ainda nao tive tempo de o terminar. O que terás que fazer é utilizar um serviço de DNS dinâmico como o DynDNS e introduzir essa configuração na Foscam na seccção DDNS. A partir daí, irás ter um url "teu", tipo: aminhacamara.dyndns.com (há varios nomes base à escolha) e poderás aceder à tua câmara a partir de qualquer lado. Has anyone had a problem with the IP Camera Tool? I just got this camera, hooked it up...it did it's little pan and tilt dance, installed the software, but when I click on the ip Camera Too, I just get a blank white screen? Both camera and computer is hooked up to Cable modem. The software is on Windows vista...anywhone hit this problem and know how to resolve it? Is it no longer possible to choose the wifi channel ? I have a camera from DealExtreme, sku.26358. My question is: is it possible to upgrade it to any version from foscam? Or is there any possible upgrade to this camera? Sku 26358 seems to be the 'illegal copy' that Foscam warns about on their contact page. From what I heard it does use their firmware. So I'd say it's compatible. I know that BUT the question is: did anyone try to upgrade it? I do not want to break it! My Sku 26358, buy 10/2009 wotk fine with last Foscam firmware. I can't find anything about this security flaw, but FI8908W users be adviced. Instead of enter any user or password click on "Sign in mobile phone", and watch what happens. there's no 'Sign in mobile phone' on the Foscam models ...you must have some clone. i have purchased a 1p camera like the one above , doesnt have a name or serial on it , have connected to power supply and to my belkin wireless g modem-router , have installed software that came with the ip cam , but it will not find it , the green light on the camera stays on for 10 seconds and then goes off for 5 seconds and so on , i have tried pressing the reset button but without any luck , any ideas what i need to do , all help much appreciated. might not be related to you, but I've recently acquired another batch of FOscam cams, and couldn't get it to work with a Draytek Wireless Router. But I can't access any of the Foscam cameras. I had to connect a different wifi router to the main router, creating a secondary WiFi network, and it worked like a charm. But, in your case, if you're using the ethernet cable... It should show up in their "Camera software". i actually got the camera working i have it setup at http://davemc.dyndns-ip.com/ but no one can view , i can view it from different pc's on my network but not on anyone elses pc's , now this is where i am stuck , on my belkin it has virtual servers ( port forwarding ) and i did set it to port 80 , should i set it to a different port . 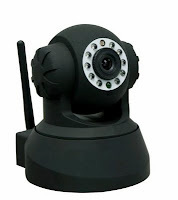 Check the post "How to access your IP camera from the Internet". Should sort you out. i got 3 cameras working very well, but i don't know how to speak to the camera i plug my microphone to the pc and i try to speak and nothing happen, if anyone know how to use this feature, i'll be really thankfull if you tell me how. By the way this is a great website very usefull. it's only from the ActiveX interface (for IE) that you can use sound. You'll see small icons that activate micro, speaker, and video recording. But you'll be disappointed, the audio quality is quite ugly! when i try and record and save as an avi , it doesnt save , even though it records it doesnt save to the folder that i ask it to , the folder is always blank or it says i dont have permission to save there would i like to save to my videos folder and if i click yes it still doesnt save it , any help much appreciated. Where are the pictures taken as "motion alarms" stored? I can't get the email settings correct for the life of me!!! Ravat trading company is a scam! They say they offer support after camera is purchased. I have sent multiple emails and tried to call pre-sales support with no answer or returned call. They say link to DynDNS for a free account so you can access it over the internet but that did not work. I purchased an account through DynDNS and they tell me I need to purchase the "custom" domain in order for it to work. Not only does it not work, when I went to my control panel in an attempt to figure out a way for it to work I discovered 2 new icons(Broadcast ?? ?/ Mic???) I cannot delete or move them and they have me wondering if they are able to view the camera. Buyer beware! It's really with Foscam that you should deal for tech support, not the reseller. Like most others DynDns have free account if you just need to link your external ip address with a domain. See my guide on how to setup the ip camera for external access here. once the port forwarding in place on your router, it should work. I am trying to connect my IPCAM02 and am running it through an adsl router. I have created a dyndns account and done the linking. However I do not know how to do the port forwarding so when i access the dyndns account, all i see is my router setup page. Please assist. Check this guide and also the site portforward.com where you can find the right settings for your router model. My power just stopped one day - any idea on how to get it repaired or replaced?? I bought thru ravat trading they are useless! Got myself a F18909W, a non-pan & tilt... but the wireless doesn't work. Been playing with it all day, but no joy. Works on ethernet (with the slower blinking light as you mention), and it blinks faster when disconnected. But no IP in the camera tool. I even added the MAC to my router, still nothing. I can't tell if it's a clone. Any suggestions? I read James' post august 2012. i have been working with Foscam as well on this issue. I can't get my wireless to work. i tried the reset and changing from TKIP to TKIP/AES but can't get it on the system. what about the security? i am using spophos and firefox browser. Sorry for the late reply, I was on travel. The 1st and last topics of my FAQ for IP Cameras should help. Try the camera very close to your router, if it only works in that case, you might need to solder the wire connecting the wireless antenna inside the box. Try to keep both Access Point name AND password short and simple. Last but not least, most of these cameras can't connect to hidden AP, you need to be in broadcast mode. Not a Foscam problem, but I believe the camera is a relative. It is a great camera for daytime, but useless at night. The camera responds to the Foscam SDK cgi calls. I would like to turn off/disable the IR LEDs. Does anyone know of a hidden command to turn off the IR LEDs? The cgi command to set the LED mode does nothing I can see. That led mode command is for the green status led. On indoor models, it allowed to turn it off but has probably no real interest for the outdoor wanscam. I recall that Foscam got rid of the alarm I/O connector in their new FI8918W and reused the wiring to control the IR led ring , so it could be controlled through alarm_iolinkage if memory serves. If you don't have a green I/O connector block on your AJ-C0WA-C0D8, maybe it follow the same design. There is no I/O connector on the Wanscam camera. I tried various permutations of the cgi commands as detailed in your link. No change to the IR LEDs, but I did get some nice beeps and AVI files saved to my browser downloads folder. The JAVA only (Firefox) UI does not have all of the controls in the Active-X UI. It is possible the camera will not turn the IR LED's on/off during the daylight. I will wait until it is dark and try again and report back. One of my other cameras is a Foscam F18904W. Although the UI "looks" different, almost all of the functions except Zoom and PTZ controls are similar. The Wanscam will show the Foscam in a multi device window and vice versa. I am almost tempted to try loading a Foscam firmware. The Foscam FI8919WZ is identical to the Wanscam AJ-C0WA-C0D8. At this time there is no firmware on the Foscam site. No luck what so ever. Wanscam does not respond to support calls. I have tried five times and never a peep out of Wanscam. My recommendation is to avoid Wanscam cameras.